Much as I like Will Smith’s performance in Ali, no one played Muhammad Ali like Muhammad Ali. 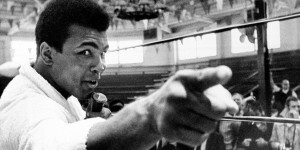 “The Greatest” inspired the Oscar-winning documentary, When We Were Kings, Michael Mann’s Ali and Stephen Frears’ HBO movie Muhammad Ali’s Greatest Fight — not to mention The Greatest, the 1977 biopic in which Ali played himself but comes off as more authentic in the fight footage than in the scripted sequences. You can read more about it here in a piece I wrote this morning. But want to know what Ali film moved you most and how his films match up to the great boxing films like Body and Soul, Rocky and Raging Bull.